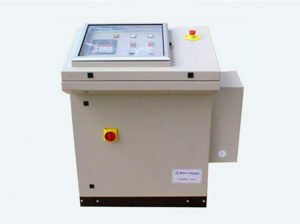 Electro-mechanical equipment for the transfer of glass containers from cross-conveyor to annealing lehr belt. from 1.500 to 4.500 mm. wide annealing lehrs at a maximum speed of 9 cycles per minute. Rugged equipment suitable for RH or LH delivery and for lehrs belt up to 4500 mm wide. Built–in height adjustment system (950 to 1100 mm). Container loading by side shifting of push–bar. Electric motor mounted on belt tension adjustment slide for quick change replacement. Bar lifting device with 400 mm stroke equipped with pneumatic cylinder suitable forcompressed air from 3.5 bar supply lines. Push–bar quick change lock–in system. Push–bar squaring adjustment with remote control.